Castell Coch is a late 19th-century fairytale-style castle, built on the remains of a 13th century castle. The Castell Coch was rebuilt in the 1870s, designed by William Burges as a county retreat house for the 3rd Marquess of Bute, supposedly the richest man at that time. The actual castle was probably founded by a Welsh Lord in 1240-65, who used red sandstone extensively hence giving it the name 'Red Castle' or Castell Coch in Welsh. Castell Coch stands upon a platform atop the gorge of the River Taff and was protected from the higher ground by a deep dry moat. The four storeyed keep contains vaulted rooms and has a conical roof. The walls of Castell Coch are over 3.3m thick. The two eastern towers, the square gatehouse and the upper hall were added slightly later. The castle has a drawbridge, portcullis, a lovely courtyard and its interiors are well decorated. The castle may have an authentic medieval look from the exterior but the interiors are pure Victorian fantasy, richly decorated and highly imaginative. Visitors to the Castell Couch are held spell bound by the dazzling ceilings, the scenes from Aesop's Fables on the walls, the bird and animal moldings around the doors and the exquisite furnishings and fireplaces. Castell Coch, a visual treat for tourists is open all around the year except on Christmas and for a six-week period in January - February for conservation and cleaning tasks. The admission fee ranges from ?2.50 for children and seniors to ?3.00 for Adults Seniors. Castell Coch is administered by the C.A.D.W, Wales. The Castle provides great facilities for visitors like guided tours, audiovisual tours, providing leaflets and maps. 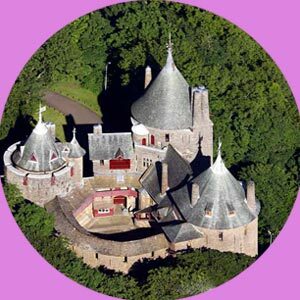 Castell Coch also houses an exhibition hall and a restaurant, which provides absolutely fabulous Welsh cakes.